This is the fourth article in our Guide to Suit Style. 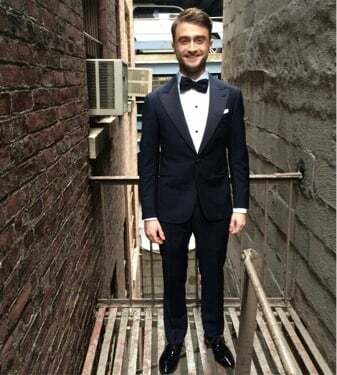 Following on from previous articles on single and double-breasted suits, in this article we turn our attention to body shape, and how different styles and elements in a suit can change the impression of his physique. By the time most men buy their first suit, their body shape is relatively set. While the chest and (particularly) the waist will fluctuate over time, a man’s height, shoulder width, and length of limb will not change. Given these fixed attributes, it’s worth a man understanding how they can be accentuated or mitigated by the subtleties of a suit’s design. Tall or short, broad or narrow – even average build – there are things he should consider whether buying a ready-made suit or commissioning bespoke. I should also say at this point that none of the following recommendations are ‘rules’. A short man can dress as he likes, in any style. If he is interested in looking taller, there are some things he can do to help. But whether that’s a priority is entirely up to him. For a short man to create an impression of height, the first thing he should do is avoid any excess cloth. This adds bulk to the suit and emphasises a shorter stature – so go with a close fit. Nothing is worse for a short man than a jacket that swamps him, whether on the arms, waist or hips. In terms of style, this means moderate or soft padding in the shoulders, and no more than a little drape in the chest. A one-button, or maximum two-button jacket with a lowish buttoning point will also increase the impression of height. The more buttons there are, the more horizontal points break up the front of the jacket, and, probably more importantly, the shorter the lapels have to be. The sweep of a suit’s lapel from neck to waist is the strongest line in the suit and potentially it’s most flattering. So keep that line as long as possible, with the jacket closed. The V of the chest thus created will accentuate the shoulders and suggest athletic shape. The difference between one and two buttons is small, as the waist button will not move much, if at all, with the addition of a button below it. The jacket’s waist should be quite close, or ‘suppressed’, in line with the theme of keeping cloth to a minimum. The skirt (the lower half of the jacket, from the waist down) should be relatively short to lengthen the legs, but not as short as the trendy ‘bum freezer’ jackets so popular over the past 10 years. High vents will also add to the impression of height; though if you can resist the urge to put your hands in your pockets, a ventless jacket can be even better. Arguably, however, it’s the trouser line rather than the jacket that makes a man look tallest. Ideally the waist of the trousers should be high and at a man’s natural waist (around the belly button, if not higher). This may feel unnatural to some, but it does make the legs look longer and produce cleaner lines in any pleats. 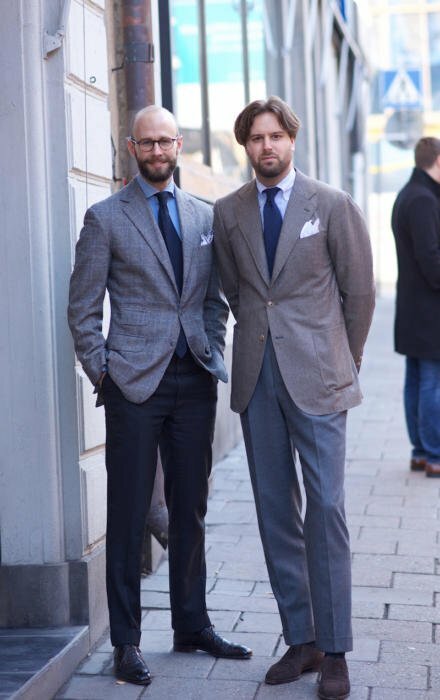 If you go for a lower rise, keep to a relatively slim trouser leg with sharp creases in the front. Cuffs or a large break also interrupt the long lines we’re aiming for, so best to avoid both. The ideal is a clean, unbroken line in the trouser at the back, and a slight break at the front (achieved by angling the bottom of the trouser slightly). Finally, anything that removes bulk or the impression of width from the look of the suit is beneficial. So avoid ticket pockets, large pocket flaps and patch pockets. If the notch in the lapel can be a little higher, that will also help. Think of bulk when choosing the cloth too: a darker, finer worsted wools will create a sharp silhouette. You should avoid pale tones, bright colours and large patterns (particularly checks), although a fine pinstripe can elongate. As to the rest of the outfit, dark shoes and a simple tie will accentuate the look, and avoid the contrast of sports jackets or odd waistcoats. 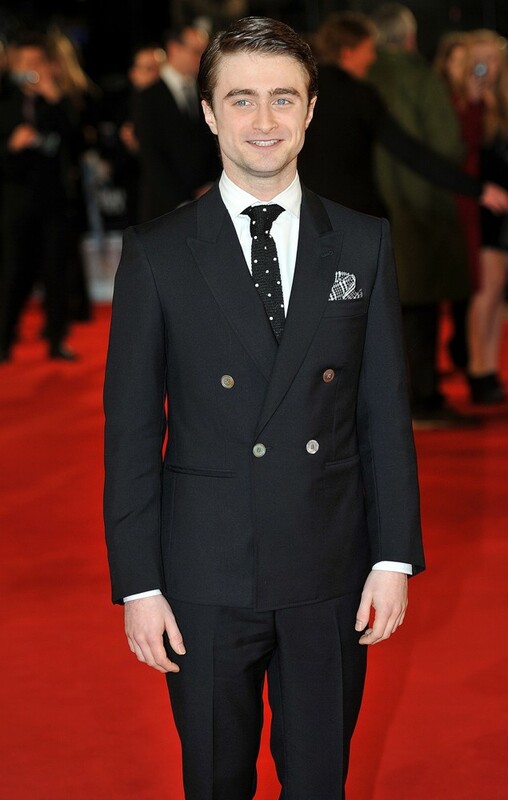 The same Daniel Radcliffe in a dark, sleek dinner suit. Note the low buttoning point, peak lapels, and slimmer pants with little break. Now reverse everything we’ve said for a tall man. Interrupt the look at every possible opportunity: ticket pockets, patch pockets, broad checks and odd jackets. Wear a belt, have trouser cuffs and buy some brogues – the more texture the better. Throw the eye sideways with a pocket handkerchief, eschew a smooth silk tie and opt for a textured wool or shantung silk instead. Wear a waistcoat; wear a watch; have your sleeves a touch shorter so there is always a half-inch of shirt cuff – anything to break up the lines. Tall men and narrow men have the same tools at their disposal. The thin should ape the tactics of the tall man, the large man those of the short. 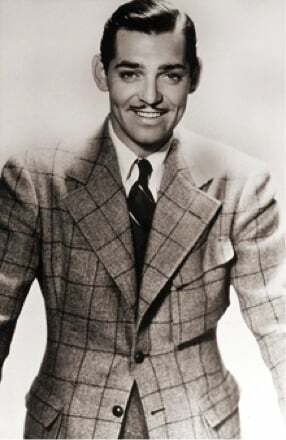 At 6’1”, screen idol Clark Gable’s use of pattern and texture interrupts his tall physique. If you are tall and stout, or thin and short, consider your priorities and apply accordingly. Men tend to want to avoid the latter of those two pairs most. The beauty of buying a bespoke or made-to-measure suit is you can specify many more of these elements. But then again, a tailor is also there, ready to give you advice on such things. If anything, understanding the effect of these elements on a ready-to-wear suit is the most useful – something to bear in mind as you carry those 4 different choices to the changing room. You can follow the discussion on Suit Style 4: Flattering the tall and the short by entering your email address in the box below. You will then receive an email every time a new comment is added. These will also contain a link to a page where you can stop the alerts, and remove all of your related data from the site. Not being the tallest person around I find balance is the hardest thing to get right. I am torso heavy (im 5”10 with 28.5 inch inseam) If I buy a short length jacket it is a “bum-freezer” if I buy a regular length jacket and have it shortened then I do run the risk of the jacket looking odd and off balance. As a 5’7″ man, in a world with relatively few short fittings, I can but sympathise. Seems very unfair that tall men get to have all the fun with regards to embellishing their outfits!! 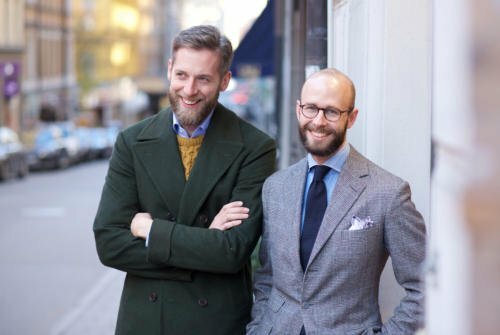 Would you agree that getting the big things right: no break slim trousers, long lapels, etc., would achieve the same heightening effect regardless of whether the shorter gentlemen wears a wristwatch or textured wool tie? Where is the jacket in the top picture from Simon? Navy one button jacket ..huntsman? Many thanks for this very instructive post! Yet there’s a further issue that arises when one has to factor in the width of lapels. What would you suggest in that respect. I don’t think the post “how wide should my jacket’s lapels be” does provide a guide workable within the framework you have in mind in this new post. Love the grey jacket in the Skoaktiebolaget pictures. I’m sure you’ve already mentioned this before, but who is the maker of the jacket? Anything specifically to consider for those of average build? Free to cherry-pick from either short or tall? I’m genuinely curious. Thanks much. Thanks for this. And for your blog as a whole. Very very helpful. Not sure I fully agree though. By interrupting the naturally elegant, vertical lines of a suit, one draws attention to those aspects that a tall, slim man might want to hide. For instance, I am tall with slim legs, something I wouldn’t want to accentuate. Though trouser cuffs may suggest width, in my experience they also add “stiffness” to the drape of the trousers. This, plus the horizontal line, draws attention to features of my body I’d like to leave unnoticed. What about waistcoats? I’ve read different things from different people. In your opinion Simon, are they lengthening or shortening? I am 5″7 and I have also though on this topic and to be honest after several years of reading about style I am still not able to form a solid opinion on how I should dress in order to look taller. I understand the theory about vertical lines, but this theory is not 100% solid. There is a theory that horizontal lines makes you look taller (Google). Furthermore, when short guys dress similarly, certain looks start to be associated with short guys and than these looks appear to me short when looking on photos. For example 2×1 and 4×1 double breasted jackets. 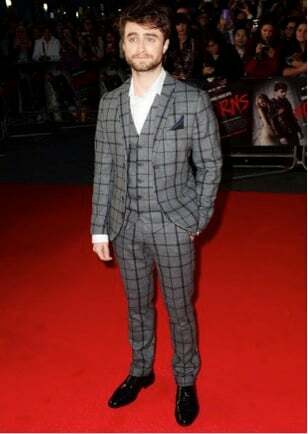 Check Daniel Radcliffe on this photo. 4×1 should in theory make him look taller, but in fact I perceive him on this photo as shorter. I think he would have looked much better in a 6×2 double breasted with smaller buttons. Look at Edward Sexton on this photo. He is a short guy and when he violates many “rules” (6×2, pocket flaps, ticket pocket ect) he actually looks bigger and taller. Maybe because people subconsciously associate such look with taller guys. So I think this is a very complex and controversial topic. 1. Maybe there is a difference in the perception live and on photos. 2. Stereotypes play a part. 3. The goals for shorter guys are also somewhat unclear. If you are short and slim, is it really better to look taller and slimmer or it might be better to look broader? A skinny look is not at all flattering for a man. 4. And even if one agrees on the goals it is very unclear what works and what does not. For me personally – I like high rise trousers without turn-ups and I like 6×2 double breasted jackets. I don’t like flaps and until now I have only unpatterned or subtle herringbone coats. I think on photos for me this strategy works well. Interesting points, particularly on things that should perhaps sit higher up the priority list than looking taller or shorter. It’s also worth remembering that looking wider and taller are often achieved with different effects – I’d argue Edward looks ‘bigger’ there, ie broader but not necessarily taller. You make some of the most interesting points I’ve ever read on this subject. I am 5’8″ tall, have a 43″ chest and a 33″ waist. My wife calls me ‘The Gladiator’ others are less respectful and talk about “built like a s**t house door”. I’ve always tried to keep in shape but at 63 years of age I long ago discovered that time waits for no man. 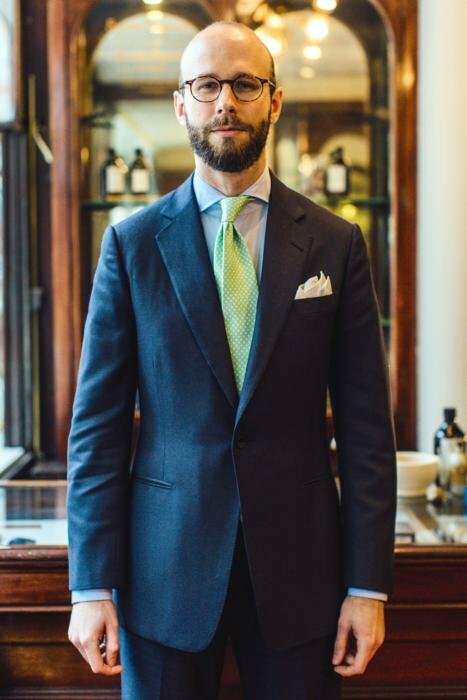 I mention all of this because my tailor of choice is A&S and I more often than not favour their single breasted house style but do sport a DB from time to time. Theoretically when I read some pundits the ‘drape’ should not be for me but it is because anything that gives me more definition makes me look like a thug. Regarding the height issue, I don’t think it hinges around double or single breasted. I think it’s all about the cut and avoiding obvious lunacies like not cutting your body in half with dark and light colours, avoiding completely 3 button suits unless its button 2 roll 3 and never wenecessarilyaring jackets that are too long. I don’t subscribe to the view that lapels should necessarily narrow. I think they should be proportionate to chest width. Also, I think cloth plays a part. I wear a lot of corduroy or cashco suits because I like them and they suit my life style but I once made a mistake and had one cut in jumbo cord – it made me look like an agricultural worker ! 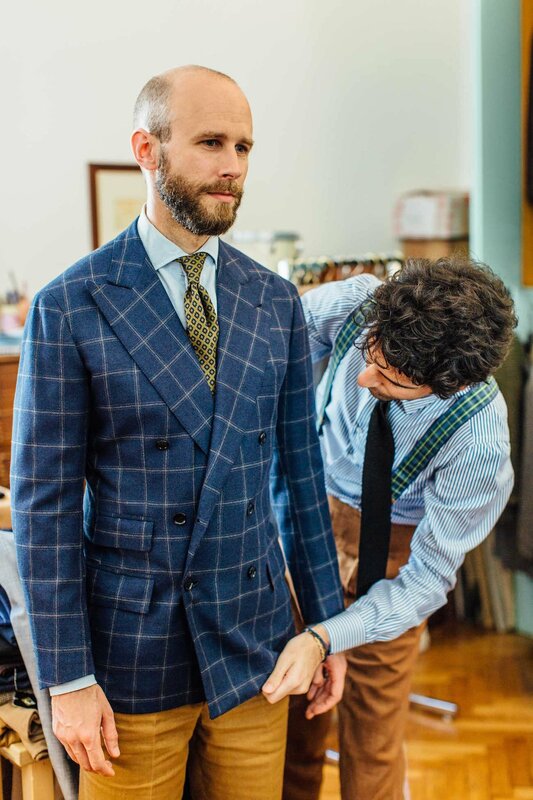 All in all it comes down to getting absolutely the best tailor for you who truly understands your shape. Not sure where to post this, but you requested I do so, so here we go. I have never asked advice before on suit styling as I am pretty confident in my choices thus far. I read your blog everyday and have learned much and your advice has always proven useful and has saved me tonnes of time and money. This is why I am coming to you. I am designing a new suit. The suit will be a Black and White Houndstooth (more Puppytooth), the fabric is 11/12 ounce flannel. I have decided on a natural shouldered, single breasted, 3 roll 2 1/2, double vent, and am really wondering about getting patch flap bellow pockets on it. They will NOT be pleated and will not have buttons. Since I live in a suburban area I lean towards country suit details and I have had suits (gabardine) and sport jackets (herringbone tweed) done with patch flap pockets and love them to death — my favourite style detail. This suit will obviously be another country suit and I work in an industry that I can wear whatever I like as long as it is smart. I have a 40″ chest and 30 waist and am 5’10”. I find the pockets help add visual weight. I am just wondering if you would recommend trying one with patch flap bellow or should I stick to maybe just a patch pocket, or even patch flap? Nice thought process. Personally I would go with just patch, as the puppy tooth sounds relatively formal. What about the rules on double-breasted vs. single breasted? I am 5’11, around 153lbs., and have a huge “drop” between chest and waist. I am not sure I would care for the “look” at this point, but is there a viable solution for those with my build that would like to own a double-breasted suit/jacket? Question: theoretically, how should one dress if they are short (5’5″) & shaped like an inverted triangle – broad shoulders and narrow waist? Are they best served in an X shaped, Y, shaped or )( shaped jacket? How does the amount of belly on the lapel affect the wearer vs. a straighter lapel. Your thoughts on thoughts will much be appreciated. THanks for this article, as a ‘shorter’ man, the advice is helpful. But in terms of overcoats, you’ve never really touched upon how to flatter the tall and short. Would you say for the shorter men, avoid any overcoats that sits below the knee as it will shorten the appearance of the legs right? Would you say the ideal length for any coats/overcoats is above the knee? For a shorter man, probably yes. A top coat, in other words. I’m tall and slim with long arms. What suit jacket length measurement works best? Cover behind? To knuckles? Something else? Being 5’7” with short arms, I find that jackets that end at mid thumb don’t cover my seat. Which would you favor? A longer jacket that does? My question is somewhat related to Anonymous’. A devil-in-the-details question related to proportions of jacket length, where arms fall, and seat coverage. I’m 5′ 8.5″, so about average or just shy. I’ve been staring at the PS Lookbook page and noticing that, on you at least, the SB jacket length looks right when the skirt falls at or just above the line of the crotch, viewed from the front. Too much above this creates an imbalance to my eye. Also, you are by definition covering the seat going off this ‘rule’. In my own proportions, the average jacket in my wardrobe falls to this point, but my arms seem shorter than average, because with the appropriate seat coverage, my fingers only extend past the jacket by maybe an inch. I wish it could be more. Unlike Anonymous though, I’m closer to average height and suspect I need not shorten everything in proportion (as mentioned in this article). I understand this balance needs to flatter and compromises must be made. Would you jeopardise a little bum coverage to make the arms appear longer (thereby shortening length of jacket) or embrace the more “traditional” cut of the jacket and let the arms fall where they may? Different for a suit vs sport jacket? Just for reference, Simon, what’s the back length on your jackets on average? I have a different question in regard to fit, or perhaps more generally about how to dress according to one’s body type. Specifically, I’m curious about your experience regarding dressing to suit a rather small head. I find that the broader shoulders of a formal jacket often exagerates my relatively small head. Another issue I’ve ran into is the shirt collar, which I prefer cutaway with Points extending below the jacket, but which then often seems unproportionally large compared to my face. Furthermore, I have issues with finding glasses, especially sunglasses, and hats, that don’t make my head seem smaller than it already is. My face is neither tall nor wide, simply rather tiny compared to my otherwise tall, but slim, body. I’d appreciate any thoughts and pointers you might have on the matter. A tricky one. I do think it’s worth looking at having softer shoulders if you can, which will also often be narrower. On the shirt collar, try to find them not as high perhaps, or ask for that if you have them made. That might be more important than the spread itself. Sunglasses and hats are rather separate, as you’re unlikely to have these made. And here it’s just about averages – most are made to average, middle sizings to maximise sales. Particularly with hats. I’ll write something on sunglass sizing soon as well, but on hats consider my sizing advice here, and then try to go somewhere and browse all the styles if you can. Even tell the salesperson you need something smaller, for example. Indeed softer shoulders have seemed to be a way out, albeit an unfortunately restrictive one. None the less, I guess there are different alternatives even within this, so I’ll have to do some searching. As for collars, I’m also faced with a rather long neck, essentially ruling out a lower one from what I myself can judge. I look forward to your post on glasses, and appreciate the advice on hat sizing. I’ll have to try some different models. 1. if the suit consist jetted pocket and one button which are formal detail, but with a notch lapel that’s reatively casual, wouldnt this looks odd? 2. with the jetted pocket, would you suggest straight or slant? 3. What’s theory behind a longer lapel and lower button stance make me look taller? I know that you suppose to have shorter jacket and high rise pants to make your leg look longer, but what exactly does longer lapel and lower button stance do? Do they lengthen the torso? if they do, would that make me look shorter? many thanks for this article,i have some thoughts first for short man the combination sport jacket with different pant maybe more versatile since you can play with the upper and lower part of body example checked jacket witm monochrom trouser and secont what about accesories scarves,sunglasses, pocket sqare etc can be bold to catch the eye. Yes, you certainly have more options in terms of style if the jacket and trousers don’t match. The only issue is it breaks up the body more. Accessories can catch the eye too, and again those would break things up. But that doesn’t mean you shouldn’t do either of them – it’s just one more thing to throw into the balance. No one is expecting shorter men to wear dark sleek suits all the time! As someone of 5ft 7, but with square shoulders and a pronounced chest, would you suggest that a higher lapel gorge may work better for me? My understanding is a lower/standard gorge won’t draw the eye upwards as much, and may also accentuate an already big chest?